Sweet potato toast, turmeric everything, and more gluten-free. Those were the trends of 2017. Homemade condiments, fermented food, and probiotics were some of the hottest trends of 2018. Each year, consumers desire and crave a change from restaurants. The shift revolves around the evolving and growing demographics and new implementation of technology. As we head into 2019, the demand for healthy food has never been higher. Customers are demanding more “health-oriented” food that is fresh, additive-free, and organic. Customers will commonly inquire whether or not the salmon on the menu is wild or farm-raised or if the lamb is from the local grass-fed farm a few miles away. Transparency, sustainability, and locality are taking over the industry. So what does that mean from the food we eat? 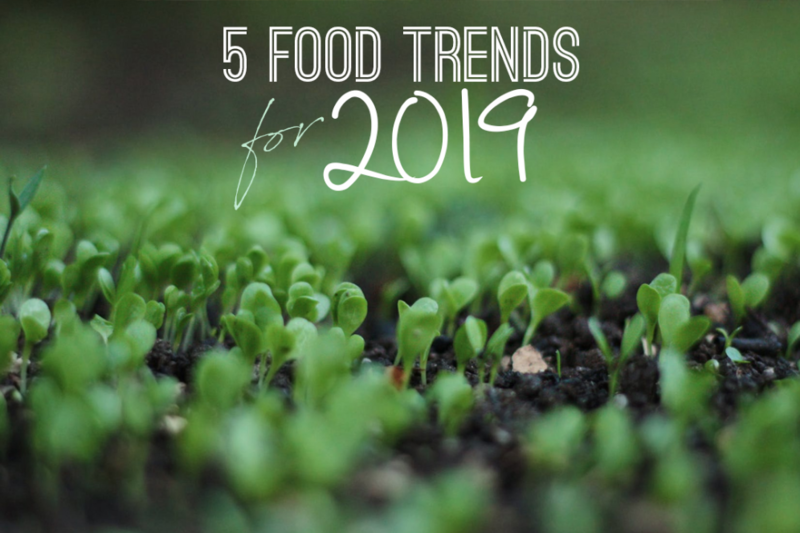 Here are 5 food trends for 2019. Restaurateurs are constantly fighting the battle of food waste. More and more chefs are getting creative with how to reuse their food and leftovers instead of chucking them in the garbage. Unsightly vegetables, overripe fruits, or less-than-perfect herbs can be used to compose a beautiful meal. The overall goal is to minimize food waste and redirect it into our bellies! Before there was low fat, there was sugar-free. The movement to get rid of sugar is increasing each year. Over 65 percent of consumers reported they want to cut back on or eliminate it, per The NPD Group. Sugar can be found in endless amounts of processed foods, and consumers are beginning to shift away from purchasing items that are unnatural or contain high amounts of sugar, especially since recent studies have shown that a high intake of sugar can increase a person’s risk of cancer and directly affects one’s metabolism. Customers now want the truth and nothing but the truth about the food they eat. Where is the food sourced from? What ingredients can be found in the dish? How was the meal prepared? In the upcoming year, people will increasingly want answers to these types of questions. A restaurant will benefit from opening the curtain and showing what happens behind the scenes. By providing a menu that is transparent, your customers will appreciate the openness and efforts behind the food they’re eating, which in turn will create better customer loyalty to your restaurant versus others who might not be as forthcoming. Every time you enter a restaurant, there’s no doubt you notice a subtle change. Is it the food? The people? The environment? Possibly, but odds are the restaurant has adopted new technology. Now, you can order online, choose what wine you want from an iPad or schedule a reservation from your phone. Or you didn’t talk to anyone when ordering your food because you ordered from a kiosk. With many new initiatives coming every year, big data will continue to be used to a restaurant’s advantage to improve efficiencies, operations, sales and overall business all for the sake of giving what the customer demands.